SHOULD WE GET MARRIED? You know you're in love --you always want to be together, and you think about each other all the time--but does that mean you're ready to get married? How do you decide if your relationship is strong enough for marriage? William P. Smith gives you a series of questions based on biblical principles that you can use to assess your relation-ship's strengths and weaknesses. Answering these ques-tions about your vision, goals, and potential conflicts will help you decide together whether you should slow your relationship down or move forward toward marriage. 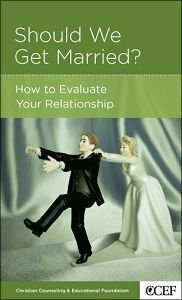 This booklet is a great resource for pastors and others to use during premarital counseling or classes. About "Should We Get Married? (Christian Counselling & Educational Foundation Series)"